Shabana Alavi was 15 when she began working at her old primary school. She had a casual job working at Viewbank Primary School’s before and after school program – a job she kept for nine years while she finished VCE and university. Working with children and seeing them grow and move on to the next stage of their lives kept Shabana in the program and helped her discover what she wanted to do with her life. Today she is a speech pathologist at the Northern School for Autism in Reservoir. “I loved working with the children at Viewbank – it was even worth getting up early in the morning for!” says Shabana. Shabana, 24, was born in Geelong where her mum was doing her residency as a GP before the family settled in Melbourne’s north-eastern suburbs. Shabana did a Bachelor of Arts majoring in Psychology and International Politics at the University of Melbourne and then had a gap year while she thought through her career path. An aunt in America is a speech pathologist and loved her work and Shabana realised this would allow her to continue working with children. So she enrolled in the two-year Masters of Speech Pathology at the University of Melbourne. “During my gap year I had an office job that was very monotonous and involved a lot of filing, contracts and data collection – I wanted to do something more hands-on,” says Shabana. 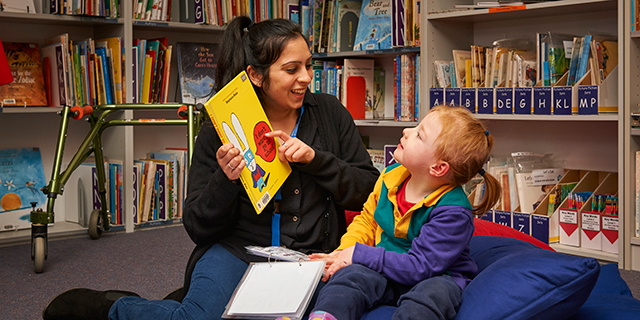 Her two-year course involved a series of placements in adult and paediatric settings but her placement at Ballarat Specialist School working with children was a favourite moment. “I loved going to that placement every day and that confirmed this is what I wanted to do. I remember helping a little girl who had cerebral palsy who was learning how to use a communication book. She couldn’t communicate verbally but used picture books to communicate and helping her learn to communicate in that way was inspiring and different to anything I’d done before,” says Shabana. She is now focused on building her experience and skills as a speech pathologist but her experiences in Ballarat have led Shabana to consider working in rural and regional Australia later. This story originally appeared in Health at Melbourne.